Finance Minister says Rabbi Shimon Bar Yochai's gravesite 'close to his heart,' promises to do everything he can to aid site's visitors. 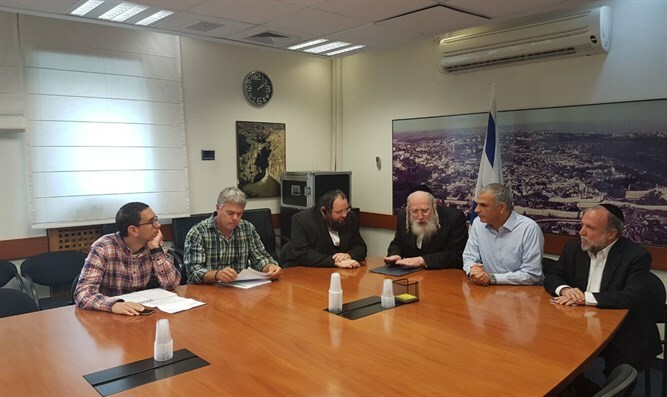 MK Yisrael Eichler (UTJ) met over the weekend with Finance Minister Moshe Kahlon (Kulanu), who also heads the committee in charge of organizing the annual pilgrimage to the mystic and Talmudic sage Rabbi Shimon Bar Yochai's (Rashbi) gravesite. This takes place approximately a month after the start of Passover on the holiday called Lag Ba'omer. The meeting concentrated on finding a solution to the parking and transportation difficulties in the area. Deputy Finance Minister Yitzhak Cohen (Shas) also participated in the meeting. Every year, on the anniversary of Rashbi's passing, thousands of Jews from all over the world travel to his gravesite, to pray and celebrate. The celebration is because, according to tradition, Rashbi asked that the day of his passing be a day of celebration and not mourning. Tradition considers Rashbi the author of the mystical work called the Zohar. "We need to enlarge the traffic circle, add dozens of dunams to the old parking lot, and add more buses to transport travelers," Eichler said. "It can't be that the police will block Jews who want to visit the holy gravesite in Meron, because of transportation or safety problems. "We need to use all available resources to allow Jews who want to visit Meron to do so. This is the second largest tourist site in Israel, and it is second only to the Western Wall. "Jews come from all over the world to visit Meron, and the government must prepare appropriately, both for Lag Ba'omer (the anniversary of Rashbi's passing) and for the rest of the year." Kahlon asked the Israel Lands Authority and those in charge of the site to make a plan and present it to the government. This, he said, would help the government appropriate the required areas to aid travel to and from Meron on Lag Ba'omer. "We will do everything we can to make the site more accessible to those wishing to pray at Rashbi's gravesite," Kahlon said, adding that Rashbi's gravesite is a place close to his heart. Kahlon also asked Cohen to ensure the site received the funding it needed prior to Lag Ba'omer.